30 APR 2009 - Scriptorium v. 2.2f: BUGFIX + RADIANCE UPDATE. - Fixed a bug that left (harmless) M&G files after uninstallation. - Newest Radiance 2.4 (by dDefender) is now included in the installer. - Outdated and superseded Radiance v. 2.1, 2.2 and 2.3 have been removed from the installer. TIRED OF READING ALL THESE INFO? JUST LOOK AT THE MARKS! Creators of custom modular stairs, fireplaces, walls (not wallpapers, but custom walls), and lamps/mods using custom lights are tired of spending half of their time explaining the users how to edit the game files, and where to find them. And users are (rightly) afraid to manually edit the game files, and to rummage their hard disks to find the folders where they hide. In brief: it helps users to install custom fireplaces, modular stairs, walls and lights. In detail: Basically, it's a revolutionary new approach to the custom scripts (modular stairs etc...). 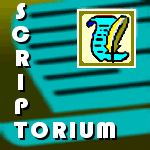 And, of course, the Scriptorium is also an installer (for Windows) that sets up your game to easily accept new custom scripts. HOW DOES THE "SCRIPTORIUM" WORK? In brief: It creates the special folders where to put the text files for the custom modular stairs etc., and instructs the game to automatically load all the file found in those folders. In detail: the Installer creates three special folders named "Scriptorium_ModularStairs", "Scriptorium_Fireplaces" and "Scriptorium_Walls" in the folder (gamedir)\The Sims 2\TSData\Res\Catalog\Scripts. These two simple steps ensure the needed support for the custom content. As an added bonus, the installer creates some shortcuts in the Downloads folder, to easily access the various "Scriptorium..." folders. (These shortcuts are ignored by the game when loading). The support for the custom lights is identical: only difference, the "lighting.txt" and the "Scriptorium_CustomLights" folder are located in (gamedir)\The Sims 2\TSData\Res\Lights. To know *exactly* what happens to your system, using the installer, read the "Manual-Installation" instructions, attached below. Windows users have the option to use the provided installer, or to perform the required steps manually. Mac users, unfortunately, can only install it by hand. Here you can choose whether you want or not the support for the various custom scripts. In particular, if you enable the support for custom light, you can choose to keep the normal Maxis lighting system (selected by default), or to install the Radiance lighting system. I strongly suggest NOT to change the default installation options, unless you *know* what you are doing. Please note that - beside the (optional) Radiance - the SCRIPTORIUM doesn't add any custom content to your game: it just enables it! Please note that the Scriptorium installer doesn't overwrite any customized file: if you have already installed (by hand, the "old way") some custom fireplaces, stairs, walls or lights, they will still be available in your game. NOTE: If you want to install the Radiance and you have customized your userStartup.config, rest assured that it will NOT be overwritten: this version of the Radiance uses the Maxis shaders, so it doesn't require to overwrite the userStartup. AUTOMATIC UNINSTALLATION: *DON'T* USE THE ADD/REMOVE PROGRAM WINDOW! In order to completely uninstall the Scriptorium, you must run the installer and choose the option "Restore Maxis lights & Uninstall Scriptorium". After the uninstallation, the custom scripts located in the various "Scriptorium_..." folders will NOT be removed, so don't be afraid to lose anything during the automatic uninstallation. MANUAL INSTALLATION (Win and Mac users): download the attached file "MANUAL-INSTALLATION_(MAC_and_WIN).txt" and follow the instructions. The manual installation only enables the support for custom scripts (the Radiance can be manually installed following the instructions provided in the Radiance threads). END-USERS - When you download a custom modular stair, a fireplace, etc., the creator will provide, along with the object itself, a simple text file. Open your Download folder, and you will find 4 new shortcuts, all marked with this icon: . And removing a custom fireplace etc. is extremely easy, too: delete the .package from the Downloads, and delete the related text files from the Scriptorium folder, and you're done! CREATORS: from now on, you don't need any more to give long instructions to the users: just create yourself a simple text file, and put in it all the code required for the fireplace etc. to work. The filename to assign to the text file is important: use the pattern "Number_CustomName.txt, where "Number" is the unique number you have chosen for your custom object (for example: "fireplace 88", or "wall 90"). By putting the unique number in front of the filename, the users will be immediately aware if they have two conflicting scripts. When you post your object, include the text file in the attachments, and then tell the users to open their Downloads and put the text file in the right Scriptorium folder (of course, the users must have installed the Scriptorium ). The SCRIPTORIUM installer is freeware, and can be used by anyone for personal use. DO NOT REPOST OR REDISTRIBUITE ANYWHERE! When you post your custom stairs etc (at MTS2 or any other site), post a link to this very thread at MTS2, to let your downloaders get the Scriptorium and easily install your creations. Also, note that I've included the Radiance Lighting System in this installer just to ensure the best compatibility with the support for custom lights, but I'm not the creator of the Radiance, nor I'm involved in any way in that project. - V. 2.3 / 2.4. If you have questions/problems related to the Radiance mods, post in the mentioned threads. FAQ 1: AFTER INSTALLING THE SCRIPTORIUM, WHAT SHOULD I DO WITH ALL THE STAIRS ETC... PREVIOUSLY INSTALLED "BY HAND"? You can just leave them alone: the "old" custom content will stay in the main script files (modularstairs.txt, fireplaces.txt or walls.txt); if you are tired of a custom object, you must uninstall it "by hand", deleting the related section from the main script. First, uninstall the Scriptorium, to restore the original situation. One by one, CUT the custom sections from the main script and PASTE it into a text file of its own; SAVE the new text file as "NN_CustomName.txt" ("NN" is the unique number written at the beginning of the custom text: e.g. "fireplace 99" or "modularStair 77"). Repeat for every custom section, until the main script contains only Maxis definitions. When done, install the Scriptorium, and put each new text file into the proper Scriptorium folder. First off, redownload the latest version of the Scriptorium (even if you already have it: it might be corrupted) and try installing again. If this doesn't help, go to the folder where you have unpacked the installer (the .exe), right-click on it and choose "Create Shortcut". Right-click on the shortcut and choose "Properties". In the very first field, delete everything and write exactly: Scriptorium_Setup.exe /LOG=log.txt then click OK.
Double-click on the shortcut to run the installer; if an error window pops up, click "Ignore" or "Continue" whenever possible. When finished, you will find a text file named log.txt in the same folder as the Scriptorium_Setup.exe: post the log.txt file as an attachment in this thread, and I will examine it. FAQ 3: THE CREATOR DIDN'T PROVIDE A SEPARATE TEXT FILE TO GO WITH THE MODULAR STAIRS, WALL, FIREPLACE ETC.! - What to do to "convert" the downloaded stuff to the new Scriptorium format. sometimes the creators forget / don't want to update their modular stairs, fireplaces etc to the Scriptorium format. In these cases, they provide a text code in the download page, suggesting to manually append it to the "modularstairs.txt" or other game file. Save the text file as "XYZ_AnyNameYouLike.txt"
Put this txt file in the proper Scriptorium folder. 23 JAN 2009 - Scriptorium v. 2.2e: RADIANCE UPDATE. The Radiance 2.3 (by dDefender) contained in this installer has been updated to v. 2.3 beta 2.0 (released today). Also, fixed a bug that prevented the Scriptorium to correctly install the Radiance files for Mansion & Garden. 28 NOV 2008 - Scriptorium v. 2.2d: RADIANCE UPDATE. The Radiance 2.3 (by dDefender) contained in this installer has been updated to v. 2.3 beta 1.9 (released today), that is compatible with Mansion and Garden. Also, included Chesspieceface in the Radiance credits. 25 NOV 2008 - Scriptorium v. 2.2c: BUGFIX. Improved the internal code so to solve the problem of the diagonal pool becoming not usable after installing custom fence-arches. Thanks again to ClicknPsycho for reporting. 23 NOV 2008 - Scriptorium v. 2.2b: BUGFIX. Fixed the path for the "Scriptorium_Decks-Foundations-Pools" shortcut (in the Downloads). Thanks to ClicknPsycho for reporting. Also, extended the credits for the Radiance mods to include Chocolate Pi and dDefender. 22 NOV 2008 - Scriptorium v. 2.2 released. NEW FEATURE: Added support for custom Decks, Foundations and Pools. UPDATE: The Radiance 2.3 (by dDefender) contained in this installer has been updated to v. 2.3 beta 1.8. 22 SEPT 2008 - Scriptorium v. 2.1c released. UPDATE: The Radiance 2.3 (by dDefender) contained in this installer has been updated to v. 2.3 beta 1.7. BUGFIX: When installing the Radiance 2.2 or 2.3, the installer now correctly finds the right installation paths in Deluxe and DoubleDeluxe games. 22 SEPT 2008 - Scriptorium v. 2.1b released. BUGFIX: The "Maxis Original Lighting" contained one broken file, that caused the UNI windows and objects not cast light. 18 SEPT 2008 - Scriptorium v. 2.1a released. UPDATE: The Radiance 2.3 (by dDefender) contained in this installer has been updated to v. 2.3 beta 1.6a. IMPROVEMENT: When the Radiance 2.3 is selected, the installer now automatically adds the needed lines to the userStartup.cheat. Please note that the userStartup.cheat is NOT overwritten, but only updated: all the custom cheats and command previously added by the user are perfectly retained. 09 SEPT 2008 - Scriptorium v. 2.1 released. BUGFIX: The "Maxis Original Lighting" actually contained some parts of the Radiance code, causing unwanted changes in dawns, sunsets and window-less rooms. Now, selecting the "Maxis Original Lighting" option really restores the Maxis lights (also useful to repair a messed up manual installation). BUGFIX: No error is issued any more when the "userstartup.cheat" file is not found in the player's game. IMPROVEMENT: The Scriptorium should now be fully compatible with Deluxe and DoubleDeluxe games. UPDATE: The Radiance 2.3 (by dDefender) contained in this installer has been updated to v. 2.3 beta 1.6. 03 JULY 2008 - Scriptorium v. 2.0 released. Added optional installation for the new Radiance 2.3 beta 1.3 (by dDefender). Easier installation of custom TXT files when using Vista: now it should be possible to manually copy TXT files into the Scriptorium folders (Vista sometimes denied permission to do that); in any case, it is possible to install TXT files by dragging and dropping them over the proper Scriptorium shortcut (placed in the Downloads folder). Improved internal code: the installer should now be capable of restoring the original Maxis lighting system in any case, even if you messed up the lights while manually installing/removing the Radiance. New uninstallation routine: in order to completely uninstall the Scriptorium and restore the original Maxis lights, you must run the installer again and choose the option "Restore Maxis lights & Uninstall Scriptorium". This is the only way of correctly uninstall it. 13 OCT 2006 - UPD to v. 1.0e - Completed the Spanish translation, that now includes also the License Agreement and the Additional info after installation. 11 OCT 2006 - UPD to v. 1.0d (bugfix) - The last version 1.0c, released only a couple of days ago, had a bug (now fixed) that forced the installer to always install the Radiance mod. 09 OCT 2006 - UPD to v. 1.0c (Minor update) -Multiple languages are now available for the installer (only the installer messages: the Licence Agreement and the final notes are only Eng/Ita). Also, the graphics shown during installation have been renewed. 26 SEPT 2006 - UPD to v. 1.0b (Bug fix) - After only few hours since the first release, I've discovered a bug: the Scriptorium didn't enable correctly the support for the fireplaces. The new version 1.0b fixes this bug. 27 SEPT 2006 - MAC USERS! - There was a typo in the previous installation instruction: the wildInclude... lines must end with a quotation mark! [/B] Now the instructions have been corrected. 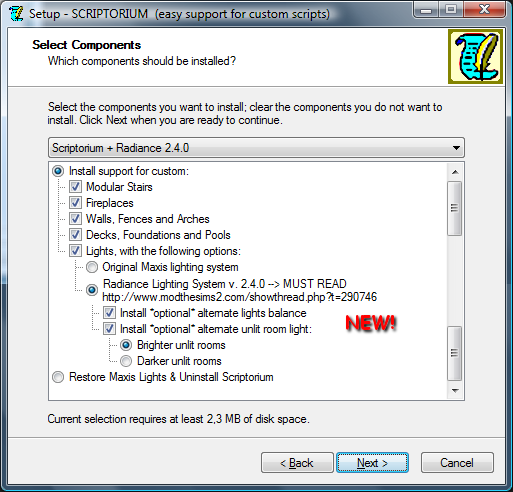 26 SEPT 2006 - Version 1.0 released - The SCRIPTORIUM replaces the older Custom Walls installer (now removed), and also includes the custom light support & Radiance formerly provided by the CEP installer (that now is again a CEP-only installer). 7904 people have said thanks to Numenor for this download. 3. Follow the instruction provided in the "Overview" post for the AUTOMATIC or MANUAL installation. NOTE - The Scriptorium is an installer: DO NOT put it in the Downloads folder! Read the Overview for info about using the Scriptorium.